The Carson Wentz Debut: So What? After being drafted by the Philadelphia Eagles, no one was sure when the North Dakota State product would make his debut, but a desperation trade by the Vikings made the picture much clearer. 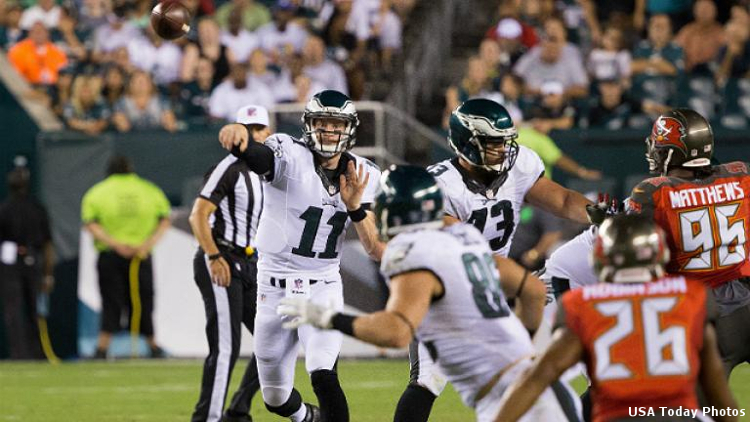 Mark Schofield analyzes the good and bad of the much-anticipated Carson Wentz debut. Carson Wentz made his NFL debut on Sunday against the Cleveland Browns, and exceeded even the loftiest expectations of Philadelphia Eagles fans. The rookie quarterback completed 22 of 37 passes for 278 yards and two touchdowns, with no interceptions. This performance was even more impressive when you consider that he missed the final three preseason games with a fractured rib. 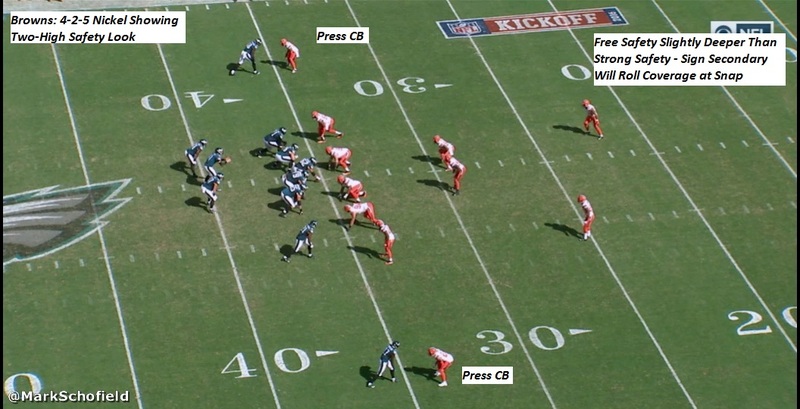 But the Eagles’ coaching staff also provided him with concepts to execute that suited his game well, and the QB was able to take advantage of two impressive routes against man coverage on his touchdown tosses. Despite the great debut, some of the flaws in his game that concerned evaluators pre-draft were still present, and remain something the young QB will need to work on as he continues his development. One of the strengths identified in Wentz’s game pre-draft was his ability to throw on the move. A very athletic quarterback for a player of his size, Wentz can deliver the football with velocity and accuracy when rolling to the right or left, or when sliding in the pocket or extending plays with his feet. 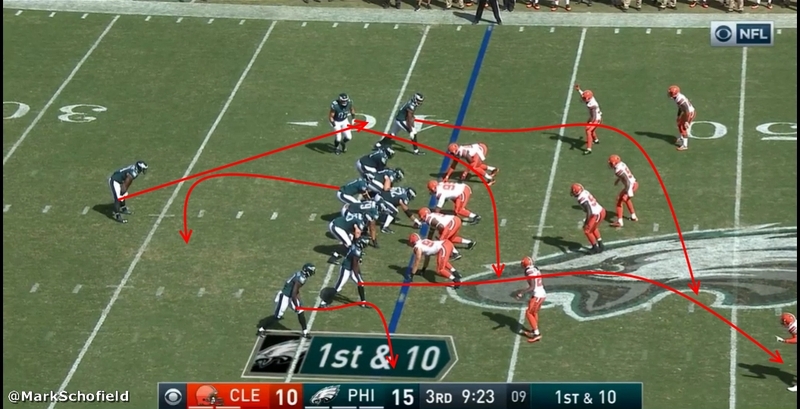 As a result, the Eagles took advantage of this with some designed rollouts, and some boot action plays. The rookie QB displays great mechanics on his delivery, keeping his throwing motion compact and getting his left shoulder pointed directly at the target to improve the placement of the pass. Wentz puts the pass on his TE perfectly, and the Eagles have another first down. That throw looks eerily familiar to a play Wentz made as a senior against Northern Iowa, broken down here by yours truly and by Ted Nguyen in this article. 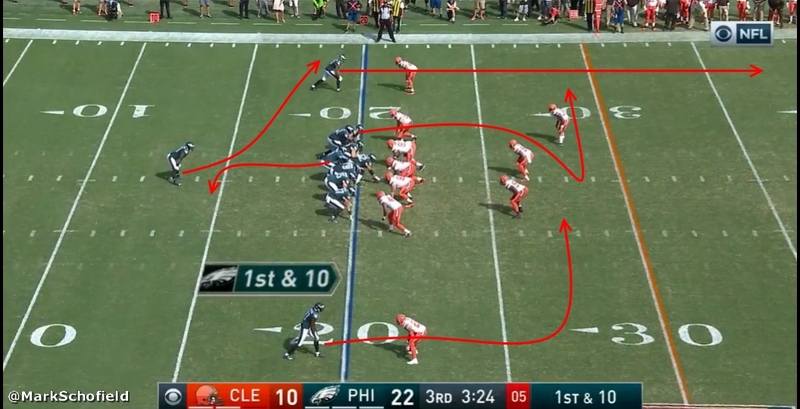 As Ted confirmed when discussing this play against the Panthers with North Dakota State offensive coordinator Tim Polasek, Wentz saw Cover 1 in the secondary and changed the play to a route concept that included a fade from the slot receiver. It’s not clear if he changed the play or this was the route called in the huddle, but the result is the same as the game against Northern Iowa. Wentz drops in a perfectly-placed pass, and the receivers hauls in the throw for a score. One of the aspects of his playing style that Wentz was trying to improve while in Fargo was accuracy on the deep throw. This was an area where he was inconsistent as a junior, and while he improved on the deep pass during his senior year, he opened his senior season against Montana and missed on some deep throws during that game. As with every debut, there is always room for improvement. This is certainly the case with Wentz’s. One of the biggest question marks surrounding the young quarterback during the draft evaluation process was his footwork in the pocket. 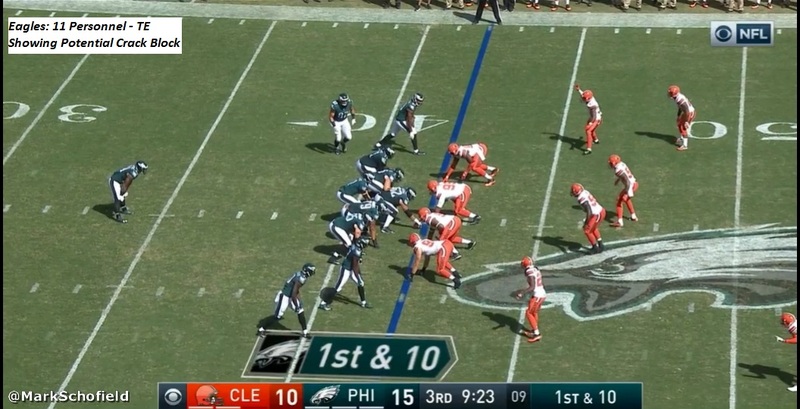 At times, Wentz had a tendency to lock onto his first read in the progression,and stand with his feet seemingly in cement as he waited for the route to develop. 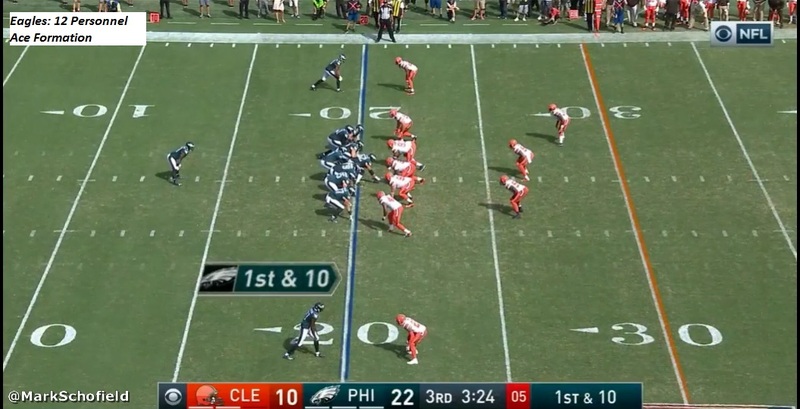 But Wentz stays stoic in the pocket, and while he makes the play here, there might be times in the future when he cannot escape the edge pressure and things end badly. 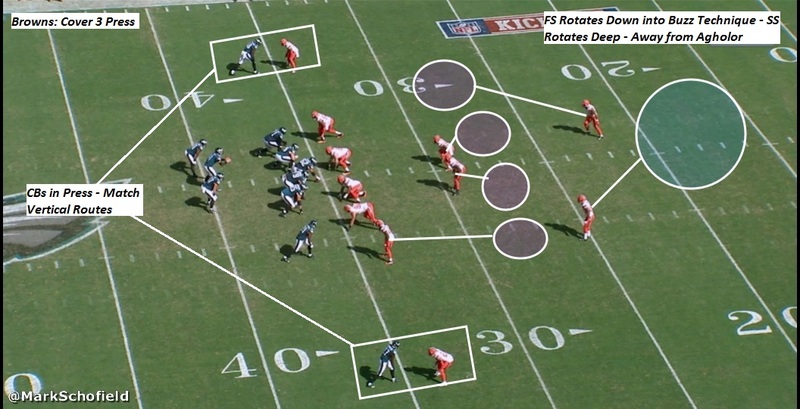 This was identified by many as something the QB will need to work on, and it’s clear from this play at least, that some work remains to be done. In all, this was a very solid debut for the rookie quarterback. Perhaps most importantly, he did not make any crucial mistakes or turn the football over. There were times when he locked onto a target and didn’t work through progressions, missing a few throws in terms of placement, but this was as good a debut as you could have asked for. Wentz will face his first road test next week against the Bears, and we shall see if the environment and different level of competition brings the rookie back to earth a bit. All film courtesy of NFL Gameday.